Setting up an ADSL gateway with a static IP account is quite easy. There are Internet Service Providers (ISPs) that require you to enter certain numbers on your computer's TCP/IP settings. These are the same numbers that you need to enter on your gateway's web-based setup page to configure a static IP account. In setting up the Linksys ADSL Gateway, make sure that the Internet connection is active. If not, contact your Internet Service Provider (ISP). After ensuring that the Internet connection is working, connect the devices together. 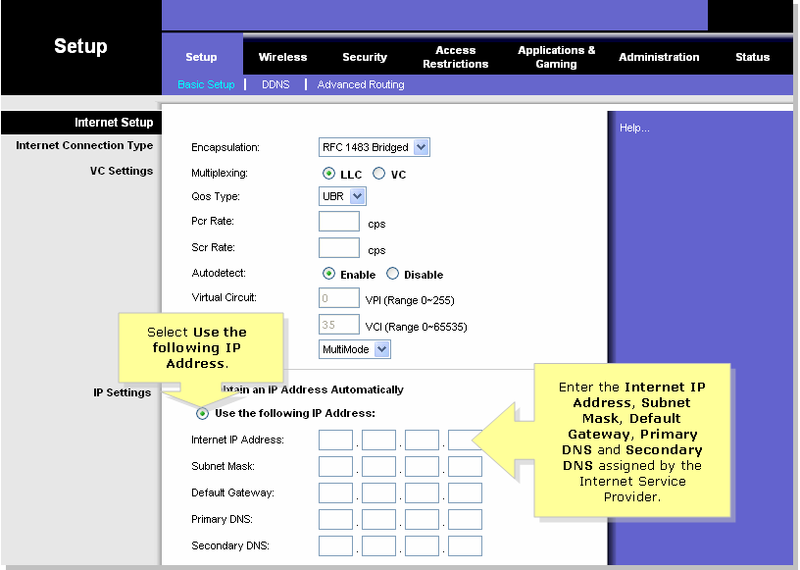 Under the Basic Setup sub-tab, look for IP Settings and select Use the following IP Address. Enter the Internet IP Address, Subnet Mask, Default Gateway, Primary DNS and Secondary DNS assigned by the Internet Service Provider. Unplug the gateway’s power cable for 30 seconds. Plug in the gateway's power. Power on the computer and test the Internet connection.